I finally got around to taking out the fuel tank in Wally, my 1974 VW Super Beetle to figure out why my steering was all messed up. Had a big dead spot and crunched when I turned at a stop or slow speed. Well, it turns out that taking the gas tank out of a Super Beetle is actually less difficult than I expected. 4 bolts, 3 hose clamps, 3 slide on vent hoses, a pulled and plugged fuel line, and a couple of minutes of wiggling and out it came. The wonky knuckle joint. 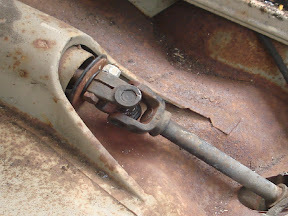 The white bolt is actually just painted that way as a warning, take this off and steering falls apart. At least that’s what I read. This splined shaft and knuckle joint were loose. All I had to do was crank it down again and all was better. Now the steering is back to being nice and tight feeling. No crunchies, no slop.